ROSEMÈRE, March 20, 2019 – At a press conference yesterday held in collaboration with the Carrefour action municipale et famille (CAMF) and UNICEF Canada, the Town of Rosemère was granted accreditation as a Child Friendly Municipality (CFM). "Children already occupy a very important place in Rosemère: sports and cultural activities, family events, Place des jeunes, etc. As a Child Friendly Municipality, we want to do a little more, that is, give them more place! In the coming weeks, we will be implementing new initiatives, such as a new library layout, summer drive-ins, a youth committee and many others, which are specifically designed for youngsters," stated Rosemère Mayor Eric Westram. 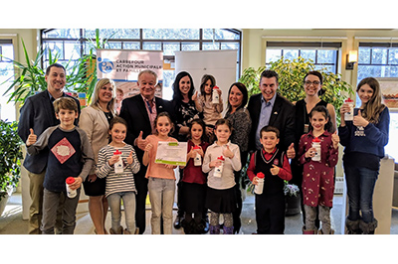 "The Town of Rosemère is now joining the global network of over 1,000 child-friendly municipalities and, in Québec, the 55 municipalities, including one RCM, that are committed to putting children at the heart of their concerns. This recognition symbolizes Rosemère's commitment to children's well-being and rights," explained Maud Allaire, second vice-president of CAMF and Contrecoeur’s Mayor. Launched in Québec in November 2009 on the occasion of the 20th anniversary of the United Nations Convention on the Rights of the Child, the Child Friendly Municipality initiative is a UNICEF accreditation and recognition program, led by CAMF. CFM accreditation symbolizes the Municipality's commitment to children's well-being and rights. By signing the charter of the CFM initiative, a municipality makes a commitment, as part of its responsibilities, to support the implementation of the Convention and to promote the emergence of projects for children within its municipality.